This article was conceived after discussing with colleagues in the industry why the payments world has been driven into the Cash vs. Digital dichotomy. My research on cash has been inspired by analyzing the penalization of cash-based industries, such as the money transfer industry by the banking sector, which has resulted in the derisking phenomenon that has hurt the traditional money transfer & remittance industry and their clients, in favor of digital models. Besides derisking as a driver of this article, the objectionable practices of card companies forcing retailers to abandon cash has also caught my attention. The legal battles cards are fighting with companies trying to allow their clients to choose their payment method (credit, debit, cash, etc.) and charge or not charge a fee, depending on the client’s choice, are also a confronting issue to follow. These issues are closely related, or part of, the “War on CashRefers to the concerted campaigns of card companies and most banks, to curtail the use of cash by consumers, pressuring regulators, convincing the public, using initiatives, some of them half merited, to advance their agenda of increasing their payment revenue... want more?”, which seems to be directed to the practice of using cash, but most of all, is directed to the companies that are still wanting to provide customers the choice of using cash. Since the use of cash is mostly spread in the lower socio-economic layers of society, the war on cash might be hurting the most vulnerable in society. Many articles are written and declarations are made on a continuous basis about “the transition from cash to digital”, on a drive to a “cashless society”, as well as on how digital payments improve people’s lives, and how governments, businesses, and development organizations need to commit to this “unquestionable” transition. Governments and development organizations are being given grants and funds to foster this transition, and businesses that use cash are being penalized by curtailing their access to banking rails. In addition, moving cash-dependent sectors to the “high risk” box in the compliance matrices makes them the targets of law-enforcement, auditors, reviewers’ scrutiny and this increases significantly their costs of doing business at every step. I see it first hand in the remittance industry. Cashless is hyped, millennials love the idea of a cashless world, investors are pepped-up and fintechs jump on cashless methods to bring disruptor ideas to market over the card and banking rails. However, are we being driven to think this way for a reason? Are the large monopolies of the financial services industry driving us to the promised land of a “cashless society” for reasons that we should examine more closely? Since my professional background is in business and marketing, it helps me see the market from this perspective. As a consultant and a moderator for international money transfer, remittance & cross-border payments panels, I have the ability to be fairly neutral when it comes to taking sides in this debate. Nevertheless, in this “war on cash” – as in everything business, I always take the side of the customer, the consumer, in regards their right to choose and their right to be presented with non-manipulative services. I also have understood that the lower the consumer is on the socio-economic ladder the fewer rights, choices, and fairness it has. Correspondingly, the more inclined are researchers, big institutions and governments to think they have the right to determine, judge and try to modify consumer behavior for “their own good”, or for “society-as-a-whole”. Concerted efforts to fight cash are now, in my opinion, part of this scenario. Don’t get me wrong, I am all about digital. Nonetheless, I care more about fair-mindedness and objectiveness. If you know anything about me, you know that I am a big advocate of change, I love technology, I am a big believer of digital solutions and I raise the banner for innovation every step of the way. But I second-guess hype, I always like to see behind the scenes and try to turn a fan on when the smoke-screens of “big business” tend to cloud the scene. And this article, for me, is part of this need. I tend to trust statistics although when I read the fine print I increasingly find how estimates play an increasing role in the numbers game, especially in the light of “fake news” strategies that are nowadays clouding facts. I do believe that most statistics from large and respectful organizations are fair in presenting, at least, the side that they want to showcase. 10.9%, along with emerging economies growing at two to three times more (Emerging Asia at 30.9%). The report highlights their Key Regulatory and Industry Initiatives (KRIIs) , in which, high on their agenda is the reduction of cash usage: “Simply stated, relevant KRIIs [such as reduction in cash usage] have the potential to spur substantive results in terms of regulators’ primary objectives—risk reduction, standardization, competition and transparency, and innovation—in the short term”. Notwithstanding the affiliation, the World Payments Report has a lot of good information. On page 48 of the report, it clearly states how difficult is to gather the payments data and how estimates are made at each instance. If non-cash usage, with data provided by banks & institutions is difficult to estimate, cash usage is, of course, much more difficult to do so. Yet, does cash in circulation gives us a parameter? Now, cash usage is also growing at the same pace – or maybe slightly lower- that non-cash payments. Currency Research cites an excellent document entitled “ The Case for Cash, Part One: Myths Dispelled”: Examining the statistics worldwide on cash issuance and usage, one concludes that […] the rate of growth in cash may be declining in some countries, cash overall continues to grow worldwide between 5% and 8% per year. Likewise, the Reserve Bank of Australia’s (RBA) estimated in 2012 that banknotes in circulation would continue to grow at a rate of around 5% per year but has adjusted its prediction with the 2015-2016 analysis upping the estimate to 7%. On a similar note, according to the San Francisco Federal Reserve, the amount of US Dollars in circulation around the world has grown 87% over the past 10 years. The report found that in 40 of 42 major economies — from Europe and Asia to Latin America and the United States — the growth of cash circulation outpaced economic growth GDP, over the last 10 years. Only two countries colored red in the map below — Norway and Sweden — experienced declines in currency in circulation (CICCurrency in circulation (CIC) is normally used in reference to "currency in hand" physical currency in circulation used to buy goods and services. In the case of the US, there is more than $1.5 trillion physical USD in circulation at any given time while approximately 1.08 trillion euros are in circulation. Both numbers have increased over the years due to... want more?). The discussion is not really about statistics, although it is important to have the facts. There has not been a major global shift from cash to digital; it has been expected, it is indeed being expected, but the rate has been slow. Most of my colleagues in the industry believe that the rate will accelerate in the years to come. This may be so, though there are many factors involved that could stall the acceleration. I am most interested in the driving currents below the surface, the intentions of different institutions on moving society to this cashless world. Those intentions are the ones we need to examine more closely so that we can understand the many camps that are fighting for the control of the payments world, inducing regulators to think one way or another and politicians to legislate one way or another. We know legislation and regulation move the market one way or another, even if the customers might not always like it. WHERE ARE WE IN THE WAR ON CASH? The war is in full rage. And the many news on both sides of the matter are difficult to filter. On the cashless front the strategy is pretty clear. The large credit card companies and their payment processors, as well as their bank allies, are making moves day-in, day-out, with propaganda and real-world action. There is a real-world action example in the Bloomberg article by Jennifer Surane we mentioned above, where it discusses how Visa is offering restaurants that agree to ditch cash for good a $10,000 reward to spend on marketing and point-of-sale technology. Thus, how would clients react to non-cash policies? Chris Donat, an analyst at Sandler O’Neill commented for the article: ”Merchants in general are unwilling to push customers to do one thing or another — merchants want to accept everything”. In some jurisdictions, regulators are reacting to these practices. The courts in the US, for example, have been debating the surcharges and discounts to clients for using, or not, card, cash, check or other payment means and whether it is illegal or not to do so. In a table published by the National Conference of State Legislatures ( NCSL ) it lists the statutes related to credit or debit card surcharges by state. Just this past January, an appeal from a court in California gave another blow to card surcharge ban laws, stating that it conflicts with merchants’ constitutional rights to recover the costs of card transactions. On the other hand, Europe seems to be going a different way: an EU directive banned since the beginning of 2018, all surcharges for paying via a credit or debit card. Are European customers getting a discount now for paying with cash? It doesn’t seem so; now all clients might face a payment fee, cash or plastic. The Guardian’s article entitled “Credit cards: is this the end of the great rip-off?” gives you an idea of UK’s reaction and reasons for this ban and its consequences. Is the war on cash, a war against cash users? Will we see soon someone offering retailers deals on using cash instead of cards? At IMTC EMEA 2018, Thierry Lebeaux, Director of the European Cash Management Association ( ESTA ), said in his presentation: “The paradox is that access to cash is controlled by a stakeholder [banks] with no interest in promoting cash and an interest in promoting its own competing products”. ESTAThe European Cash Management Association is a non-profit association established in Brussels in 1975 representing the interests of the sector throughout Europe and count 90% of the European cash management companies as members.... want more? estimates the cost of cash, public money, in Europe at €0.14 (about US $0.17) per transaction and technology is decreasing these costs. The ban on cash deposits into other’s accounts by banks in the US under the pretense of security and safety of customers’ accounts is just one of the many ways banks want to get rid of cash. On that note, we do understand the desire of banks to move out of cash since the handling, the counting, the processing is slow, expensive and filled with costs. However, technology is coming out with solutions that will make banks think twice about disenfranchising cash customers and cash-based industries. For some smart banks, cash technology is becoming a revenue center. More on that later. National Conference of State Legislatures, is a bipartisan organization established in 1975 that “serves the legislators and staffs of the nation’s 50 states, its commonwealths and territories.” The NCSLThe National Conference of State Legislatures (NCSL) was formed in the US in 1975 to improve the quality and effectiveness of state legislatures ensuring their strong and cohesive voice vis-a-vis of the federal system, promoting policy innovation, and communication between states. •... want more? monitors, tracks and researches state and state-federal legislation that impacts state politics as well as provide research and technical assistance. https://imtconferences.com/?wpfb_dl=282 – Cash in Payments – Thierry Lebeaux ESTAThe European Cash Management Association is a non-profit association established in Brussels in 1975 representing the interests of the sector throughout Europe and count 90% of the European cash management companies as members.... want more? WHY WOULD GOVERNMENTS WANT TO GET RID OF CASH AND WHY? One of the long-standing myths that have been hammered to regulators, politicians, and to society as a whole, is that cash and crime are linked; and then when cash is taken out of the picture, crime will lessen or disappear. We might have seen too many movies, many pictures of the Colombian cartel lords with the stacks of cash in hidden walls, molding away. I am absolutely sure that the stacks of cash were a very small percentage of the money laundered by these lords and the great majority was done through banks, and possibly never found. In the recent bust of the fallen Prime Minister of Malaysia, Najib Razak, 28.8 million worth of cash in different currencies was seized after the post-election raid. Cash can be counted, filmed, showcased. But, that is not even 5% of the money that authorities are seeking from the corrupt leader. The Wall Street Journal has reported it had seen a paper trail that allegedly traced close to $700 M from the fund to Mr. Najib’s personal bank accounts. History has demonstrated to us that criminals rapidly adapt to the technological changes that best facilitate their criminal behavior. In his presentation entitled “No Cash, Less Crime?” at ESTA’s Annual Conference in Budapest in May 2018, Professor Nikos Passas from Northeastern University, School of Criminology and Criminal Justice in Boston, demonstrated eloquently how misrepresented this argument is, by showing how Sweden -“the cashless country in the world”- is now battling with card fraud at unprecedented levels. With a 50% increase in the volume of fraud in the last 8 years, while volume has risen from 250 M transactions to 400 M transactions yearly and more than 70,000 reported frauds per year in 2015, jumping 350% from 2011 to 2015. HM Treasury, UK’s government’s economic and finance ministry, is consulting on the use of cash and digital payments in the new economy exploring “how the government can support digital payments and ensure that the ability to pay by cash is available for those who need it.” I highly recommend we pay attention to the outcome of this public feedback. In a very good article, Mark Gimein of The New Yorker, makes an interesting case showing how much US Cash is unreported and hidden globally. He arrives to the same conclusion as Dr. Chetty: “A bigger share [of the cash], comes from the buildup of wealth in an unreported economy of generally legal activities that are often hidden from the tax authorities.” His conclusion is that cash fuels tax evasion, and controlling cash will control tax evasion; Mark might be right. However, what percentage of tax evasion is done by cash? Maybe not even 1% as the sociologist, author and, professor at the Copenhagen Business School, Brooke Harrington  has demonstrated on her work on Tax Heavens, Wealth Managers and the Ultra-Rich. I concur, along with cash advocates that the role of the government is not to assist in the development of commercial initiatives but to defend an ecosystem where consumers can choose freely which payment means they want to use. I think that what authorities dislike the most is not knowing where the cash is and the anonymity of cash. They prefer the money to be in a bank, legally or illegally managed, rather than in people’s pockets or mattresses. Technology – digital, is also finding ways to manage that perceived anonymity, with banknote reading technologies, facial recognition, etc. Remember that large chunks of society use cash for that particular reason, its anonymity. And not because they have reasons to hide, but that is another story. It is important that you understand that Online Money Transfer Companies (OMTs), or Digital Companies as they are also called, are basically digital in the sending country and offer the services to senders in developed markets such as the US, Canada, and Europe. In the receiving country, most of the pick-up of an online transfer is in cash through large cash out networks of offices & agents. Even in the few countries where mobile money wallets receive the remittance, the recipient cashes out the money transfer. That, of course, has a tendency to change as digital ecosystems develop. One of the great arguments in the industry right now is, with the growth of the customer base of OMT companies, where are all the customers coming from? Western Union has informed that around 20% of their online customers were “offline” customers before. MoneyTrans in Europe says that only 10% of their online customers were “offline” and that 90% are new customers. Those numbers are consistent across the industry. Since the agent-cash based companies don’t seem to be losing customers (the loss of offline customers doesn’t seem to be happening), I ask the industry: where are all the customers coming from? The right answer seems to be: They are coming from the banks, those “banked” customers are moving from bank to OMT companies. industry analyst Yakov Hofner shares the same point of view : “only around 10% of remittance volume is currently sent digitally. That ratio is growing at 15-20% per year, but a larger part of this growth is coming from former wire transfer customers rather than from offline users.” We hope research is done on this subject soon. DO MONEY TRANSFER CLIENTS PREFER CASH OR DIGITAL? I encourage you to read the entire article by Yakov Hofner, where he details on the pricing of both, cash vs. digital, concluding that digital channels are somewhat more competitive and cheaper for the sender, but that the easiest to control pricing structure makes “most of well-known providers change prices on a daily basis, so a transfer fee could be 2-3x up or down at any point.” I have seen online providers change pricing 2-3 times in a day. In the software side of the matter, both in the institutional management of cash, but most of all in the logistics of cash handling, cash management companies will in the future take the management of cash out of banks and off from government’s hands. Norway has led the field in the domestic outsourcing of cash management, starting in 2001 with the creation of NOKAS (Norsk Kontantservice AS), initially a public-private company. NOKAS, now 100% in private hands, is, besides cash printing, managing in competition with other cash management companies, such as Loomis, 99% of the cash handling in the country and the Central Bank reduced its staff overseeing cash from 530 to just 18 in 2017. Moreover, we can’t forget the role that ATMs play in being the bridges of cash & digital as self-serve kiosks of cash in/cash out transactions. The evolution of ATMs from being just bank tellers to the growing number of services an ATM can provide is remarkable. 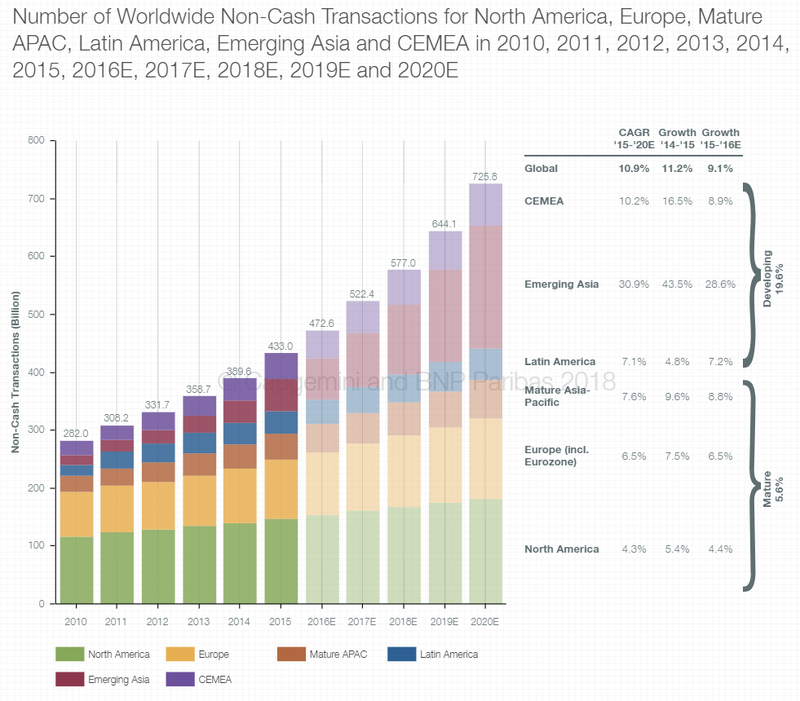 Also, is interesting how privately-owned ATMs are increasingly outnumbering Bank ATMs, another evolution of cash moving even farther away from banks. Fear of money laundering has created a huge impasse with banks while derisking is also hitting the privately-owned ATM sector. In the US, states are regulating the non-bank ATM ownership and Ohio, for example requires ATM companies to have a money transmitter license. Likewise, even how much we contrast cash & digital, it is important to note that as a contingency plan, cash continues to work when nothing else does. When digital channels are hacked, acts of God happen, or terrorism disrupt the payment networks. Cash, as a contingency plan for disruptions, is a necessity. At IMTC AFRICA 2017 in Kenya, I was able to witness first-hand the power of M-PESA and after a recent call with Claire Scharwatt, Director of Mobile Money Advocacy at GSMA where we discussed the topic of cash & mobile, I have been researching into how critical cash networks have been in the success of mobile money and mobile wallets in Asia & Africa. In the countries where regulators have been open to harness the power of mobile money, the growth of mobile money and their agent networks have been a driver of economic growth. Moreover, the restrictive legislation that Latin America, for example, has placed on mobile money as a product of bank pressures and lobbying has precluded the region from realizing this sort of change. I also wanted to mention the importance of mobile money-cash networks on humanitarian cash transfers and cash-based interventions (CBIs) in countries such as Chad, Haiti, Rwanda, Pakistan and others . http://bit.ly/2F0EVPo. Note: I don’t agree with a statement by Hanouch and Kumar: “Mobile money’s cash addiction is troubling for both the long-term viability of these services” as we need to include the importance of these agents as part of the picture and as being an important component of financial inclusion. Same as banks in certain countries, these agents are the “trust-bearers” and properly trained and catered, they can be the most valuable agents of change. I remember the slow transition in the literature of multilateral agencies from the term “bancarization” to “financial inclusion”, and the recent movement away from the terms “unbanked” and “underbanked” to the adoption of “financially excluded”. These shows me that there is a tendency of the understanding of taking the problem of “financial inclusion” away from considering banks and cards as the only vehicles for financial inclusion. With the advent of technology from mobile money to financial literacy programs, it is important that we move from the dichotomy of “banked and unbanked” to the need for financial literacy and the access to financial services by the cash-based population, the great majority in the developing world. This dichotomy of cash vs. digital is also present in the financial inclusion dialogue. It is hard to understand why the Consultative Group to Assist the Poor (CGAP) in the Council of Governors Annual Meeting in Urubamba, Peru, was drawn into this dichotomy of cash vs. digital and, instead of a debate on “Cash: The Enemy of Financial Inclusion”, could have worked on finding synergies leveraging the pros of both cash and digital which the workshop dully noted. The solutions will come from looking at ways to manage the synergies and empowering scenarios where fintechs and non-banks can innovate, bringing solutions that manage the pros of both, cash and digital. For example, Tigo Cash Paaré in Chad, for example, has been able to harness the power of cash and mobile in group saving traditions. In todays developed world, over-indebtedness and overspending -a product of the stimuli generated by cards- is making individuals, families and groups value the use of cash when educating kids on learning the use and value of money as well as the use of prepaid cards – and their mobile wallet equivalents, where cash finds its most valued digital partner. The financial management skills in the large majority of banked consumers in the US is appalling and 20% of US university students lack basic financial skills. I can’t finish without stepping into the pioneering work of innovating companies and exploring the synergies of cash and cryptocurrencies. Sometimes seen as the eradication of cash, cryptocurrencies are believed by some to be just the opposite. In IMTC EMEA 2018 conference in Brussels in May 2018, the Q&A session with Hong Kong Spark’s George Harrap was welcomed by the participants present as he described how in a city like London, cash (fiat currency) from Licensed MTOs was being accepted by bitcoin exchanges to credit their Spark accounts and to make payments to the growing number of remittance partners the company is onboarding. Heralded, as a way to bypass Banks, lower the increasing fees that Banks are demanding of MSBs and PIs and solve the derisking problem for many companies. Spark’s proposition is enticing. On a more P2P level, the growing number of VC ATMs are just that: Fiat-to-Crypto. The 3,000 or so VC ATMs in use in the world, with around 1,000 of them in the US, is a way many individuals are using to top up their VC Wallets and then use or send the cryptocurrencies to other people. An increasing number of “regular” ATMs and kiosks are being retrofitted to accept fiat and buy cryptocurrencies. Some pioneer money transfer agents are also buying and selling crypto from their own stores and providing remittance clients with tools to manage their VCs. There is anecdotical evidence of this been done to manage money in and out of Venezuela, for example. We, payment professionals, have been pushed to believe in this digital-cash dichotomy that is looking for costly and creative ways to convince us that cash is the old, digital is the new, cash is wrong, digital is the shiny avenue that will be great for all, rich and poor, developed or developing. I am questioning my beliefs on this dichotomy when I see the non-intended – and some completely intended – effects of these views. What if we stop looking at the dichotomy and work on the great synergies that can be found in the ways in which technology – digital, is making cash more efficient, less risky, less costly to distribute and manage and spend time, money & resources in developing these synergies that in the end will be much more understandable for the great world majority that uses cash day in and day out. We might even reach a more just, fair digital world that way. Think about it. In “Better than Cash Alliance” website, where members are displayed, there is the following statement: “As we are based at the United Nations, our Alliance is neutral…”. Neutral in the types of digital payments, not in the choices that people have in doing payments. I do understand the importance of digital payments in a drive to build a more efficient and financially included society. But my argument is: Why play the dichotomy? Why the great organizations, members of the Alliance, agree that cash is a method of exchange of value that needs to be challenged and replaced instead of looking at ways to harness the power that cash has with its millions and millions of users and find ways to work on the synergies? I do understand card companies and other institutions that do not benefit from the use of cash, as advocates of this dichotomy; it is understandable. But I don’t feel is understandable that we, as consumer advocates, should play the dichotomy game. Will the replacement of cash create a fairer society? Why not spend fund & resources in the way that technology – digital, can make cash networks and the people that use and/or live in these cash-dependent societies more efficient in its handling? Why penalizing cash-based industries to achieve a digital world, hurting the same people that you want to help? Why not give people resources to make the cash they use and know how to use, become easier to manage, easier to budget and reach financial inclusion in a more organic and less opportunistic way? This article is more about questions than answers, I recognize. And it went far longer than originally intended. I am glad you made it till the end. As you see, I do not have all the questions and even less, all the answers. I just want to share my thoughts with you, so, together, we challenge our beliefs and find solutions in a world with fewer dichotomies and more synergies.